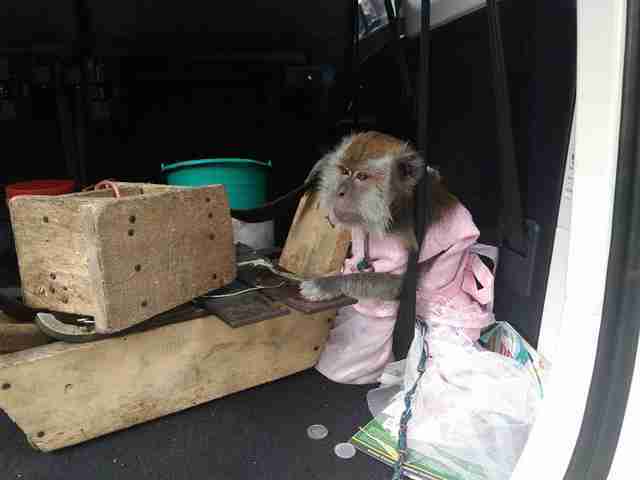 The day the macaque monkey was rescued, she was wearing a frilly, pink dress and had a metal chain locked around her neck. 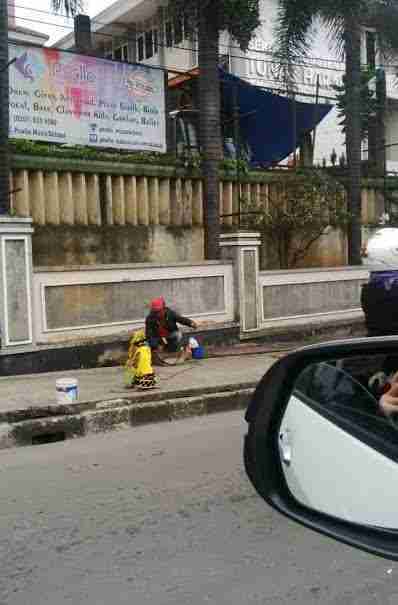 The monkey’s handlers had stationed themselves outside of a primary school in Bogor, Indonesia, a city south of Jakarta. Every time people walked by, the handlers yanked and pulled the monkey’s chain, forcing her to move around to drum music, perform acrobatic tricks and hold out a can for passersby to deposit money. In 2013, JAAN worked with the Indonesian government to install a ban on “dancing monkeys” in Jakarta. Then in 2016, the ban was extended to the West Java province of Indonesia, where Bogor is located. 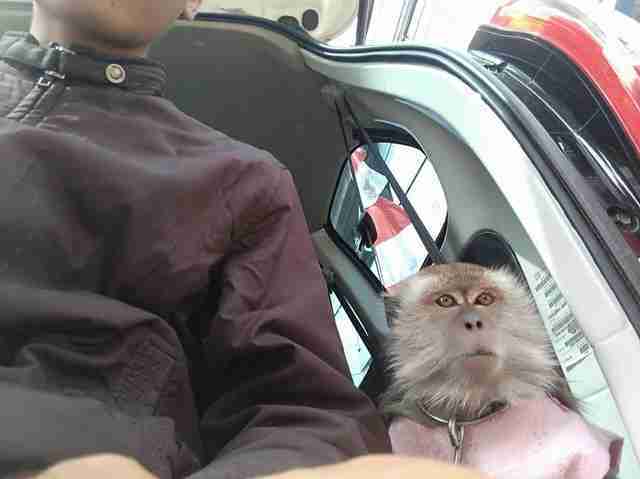 So in July, a team from JAAN arrived in Bogor to rescue the monkey in the pink dress, and take the handlers to the local police station. 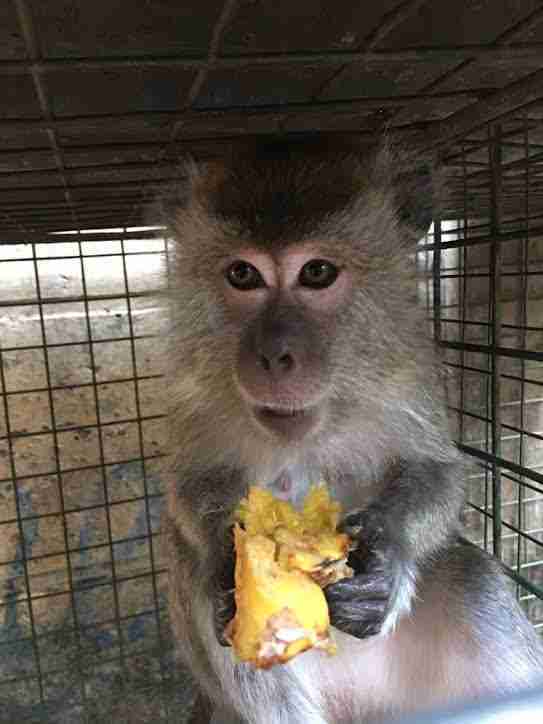 As the monkey rode in the car with the JAAN team, she was tense and terrified, and didn’t seem to have any idea that she was in safe hands now. “She looked so alien, so far from being a real monkey when we rescued her, that we named her UFO,” Den Haas said. While the JAAN team isn’t certain how old UFO is, they believe she was taken from her mother when she was just a baby, and immediately put through a grueling training regime to become a dancing monkey. The first part of the training process involves learning to stand up straight like a human. To do this, handlers will tie monkeys’ arms behind their backs and hang them up by the necks, forcing them to stand up straight. If the monkeys try to sit down or climb their chain, they'll choke themselves to death. Once they’ve learned to stand, handlers use hunger and pain to teach them to move around and perform tricks. After the JAAN team gave the handlers over to the police, they took UFO to their rescue center, where she was given a medical check. Not surprisingly, UFO was in bad health — she was malnourished, filled with parasites and had a deep puncture wound from the heavy chain around her neck. The chain turned out to have a sharp piece of steel protruding from it, which cut into her neck every time the handlers jerked the chain to make her move. The vet team put UFO on medication and treated her neck wound. They also started her on a healthy diet of insects, fresh fruit and leaves. But UFO’s dental health proved more challenging to treat — sadly, her handlers had removed the majority of her teeth to prevent her from biting anyone. 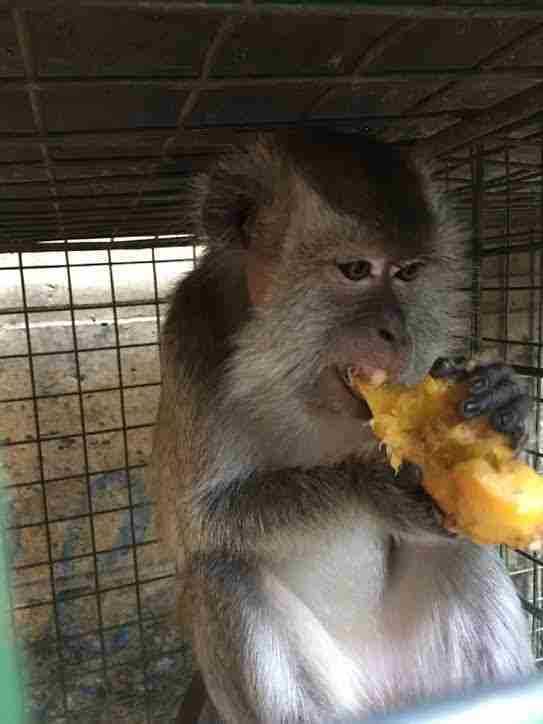 UFO will need to undergo several dental surgeries, but Den Haas expects her to make a full recovery, and eventually be released back into a protected area of forest with other rescued monkeys. This process, however, can take up to three years. Since 2013, JAAN has rescued, rehabilitated and released 137 monkeys from Jakarta, as well as 32 monkeys from the West Java province. 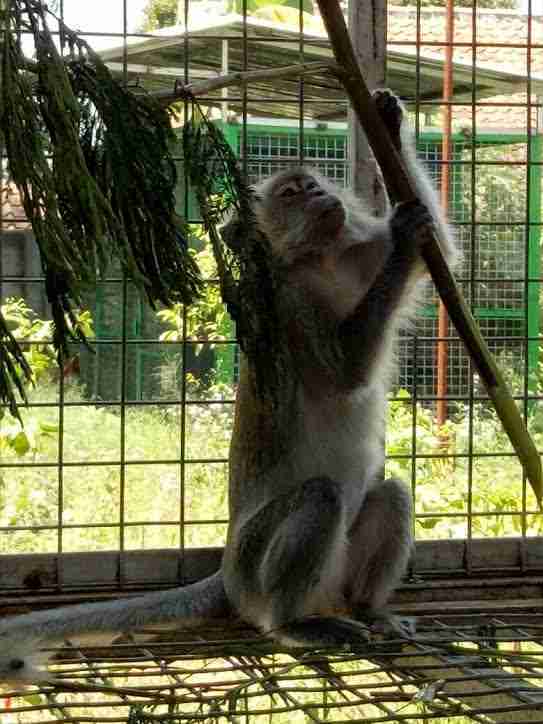 To help JAAN rescue more monkeys, and to help UFO get back into the wild, you can make a donation to JAAN. And if you’re in Indonesia and you see a dancing monkey in Jakarta or West Java, please report it by contacting JAAN.